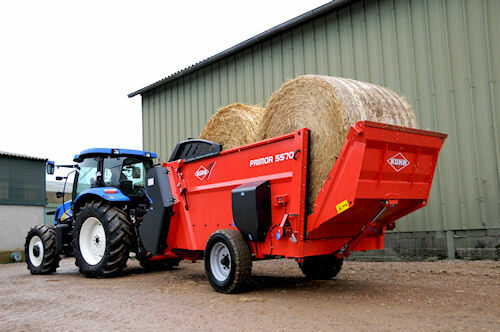 Primor 5570M handles large square bales and big round bales for bedding or forage. Heavy duty, transportable processing with low-tractor horsepower requirements are the hallmarks of the new Kuhn Primor 5570M bale processor. The machine is ideally suited for spreading bedding in a bedded-pack barn or feeding hay, sileage and baleage on the ground. It can process large square bales up to 8' 10" long, as well as round bales 4' wide and up to 6' 7" in diameter. Kuhn's new Primor 5570M bale processor is ideally suited for distribution of bedding in bedded-pack barns, as well as for direct feeding of hay. The top discharge blower allows the operator to easily direct and control the spread pattern – up to 60 feet from the discharge. The Polydrive blet system drives the feed rotor, which pulls material from the bale without overcutting, resulting in uniform material length and consistency when bedding and feeding. The exclusive Unroll System makes it possible to load up to three round bales simultaneously with little risk of jamming or uneven distribution. For more information on the Primor 5570M, visit www.kuhnnorthamerica.com.